The Santa Clara Valley Water District (Valley Water) is a member agency of the San Francisquito Creek Joint Powers Authority (SFCJPA), which is leading a project to protect East Palo Alto and Palo Alto from flooding along San Francisquito Creek between San Francisco Bay and U.S. Highway 101. These communities are at high risk of severe flooding from flows coming down the creek, particularly during high tides. Improving this stretch of about one and a half miles of San Francisquito Creek constitutes the necessary first step in an overall plan to provide more than 5,700 homes and businesses with creek flood protection during extreme tides and after sea levels rise two feet. Visit sfcjpa.org for comprehensive information on the project and adjoining projects related to the creek and Bay shoreline protection, restoration and trail enhancement. The construction of flood protection features along San Francisquito Creek that began in 2016 are now complete with major work elements installed, including floodwalls and a significantly wider creek marsh plain. We are continuing work outside the creek channel, including the final phase of installing native vegetation. While trails are now re-opened, please keep in mind that some finishing touches to the trails and adjacent areas will be addressed after January 1, 2019. 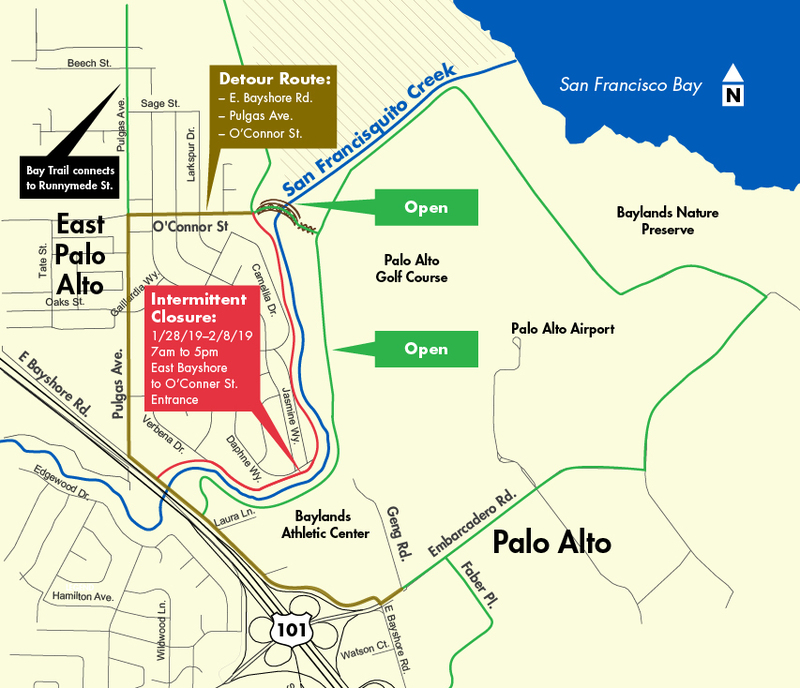 Some work may necessitate temporary closures of certain portions of trails in Palo Alto and East Palo Alto. Upcoming changes will be noted on this site and via project update emails. Sign up for project update notices. The San Francisquito Creek JPA's Bay to Highway 101 Project has completed construction of the flood protection features, and the last push to complete the project entails finishing work on trails and vegetation planting. Crews will lay base rock on the pathway from Verbena Drive to Daphne Way and make other grading improvements to the new trail behind the new flood wall. This work will necessitate intermittent trail closures in East Palo Alto from East Bayshore Road to the O’Connor Street entrance. The detour route runs from East Bayshore Road, to Pulgas Avenue extending to O’Connor Street. Please see map below. Work is scheduled from January 28 to February 8, 2019 from 7 am. – 5 pm., Monday through Friday. This segment of the trail will be re-opened as soon as work is completed. For your safety, please adhere to all trail signage and fencing. More than 100 community leaders, elected officials and agency staff braved the rain on Friday, December 14, to celebrate the completion of flood protection improvements on a key section of San Francisquito Creek. The project is not yet complete; however, the flood protection aspect is finished. There is improved access to trails and existing marsh habitat. A "horizontal levee," also known as a "living levee," slopes more gradually than a typical levee, creates a more natural, gradual transition from the levee to the adjacent marsh. As the sea level rises, the levee will adapt and continue to provide flood protection. Other improvements include a beautiful boardwalk extension to the popular Friendship Bridge, which will soon be open for use. Also, Caltrans replaced the U.S. 101 bridge to allow for more storm water to flow under the freeway. A broad range of distinguished guests spoke at the event: U.S. Representative Jackie Speier, State Senator Jerry Hill, East Palo Alto Mayor Lisa Gauthier, Palo Alto Mayor Liz Kniss, former East Palo Alto Mayor Ruben Abrica, Anne Morkill of the U.S. Fish and Wildlife Service, local resident Dennis Parker, and San Francisquito Creek Joint Powers Authority Executive Director Len Materman. The $44.5 million construction cost of the Bay to Highway 101 phase of the overall project was funded by Valley Water and many of its partners. Valley Water’s Safe, Clean Water and Natural Flood Protection Program, a voter approved 2012 special parcel tax, provided more than $28 million of the construction funding. Additional funding came from nearly $11.9 million in state grants, along with a combined total of approximately $4.5 million coming from our partner agencies: the San Mateo County Flood Control District and the cities of East Palo Alto, Palo Alto, and Menlo Park. Because this creek crosses through several city and county jurisdictions, a JPA was formed in 1999, following the devastating flood of 1998. The five members are Santa Clara Valley Water District, the San Mateo County Flood Control District, and the cities of Palo Alto, Menlo Park, and East Palo Alto. These communities are at high risk of severe flooding from flows coming down the creek, particularly during high tides. Improving this stretch of about one and a half miles of San Francisquito Creek constitutes the necessary first step in an overall plan to provide more than 5,700 homes and businesses with creek flood protection during extreme tides and after sea levels rise two feet. While the flood protection improvements are in place, work continues on environmental enhancements within the adjacent Faber Marsh. New native vegetation will be installed to provide habitat to the salt marsh harvest mouse and Ridgway’s rail. The next phase of the project is Upstream of Highway 101. Similar to the first phase, the project will provide 1% (or 100-year) flood protection, ecosystem protection, and recreational benefits. The work being done to the Upstream of Highway 101 will remedy channel constrictions and modify bridges at Newell Road and Pope/Chaucer Street. It will include a combination of: modifications to the University Avenue and Middlefield Road bridges; upstream detention; underground bypass channels; and floodwalls, that could potentially be built. Both the SFC JPA and the U.S. Army Corporation of Engineers are actively working together to develop an environmental documentation that will result in the locally preferred plan. The San Francisquito Creek Flood Protection Project is being implemented in two segments: from the Bay to Highway 101 (downstream), and upstream of Highway 101 (upstream). Once both segments are completed, the project will provide the following benefits. Preferred project with federal, state and local funding: Protect more than 3,000 parcels by providing 1% flood protection. With state and local funding only: Protect approximately 3,000 parcels from flooding (100-year protection downstream of Highway 101, and approximately 30-year protection upstream of Highway 101). Construction began in June 2016 and is expected to be complete in early 2019, with most of the work limited to June through January to protect endangered species in the area. The San Francisco Bay to Highway 101 project includes excavating decades of sediment build up in the channel, new floodwalls where private property constrains the channel, widening the channel by building a new levee through the Palo Alto Golf Course, and rebuilding the existing levee adjacent to East Palo Alto homes. Install approximately 2,800 feet of steel sheet pile floodwall along the south side of the creek between Geng Road and East Bayshore Road in Palo Alto. Install approximately 2,000 feet of steel sheet pile floodwall along the north side of the creek between Daphne Way and East Bayshore Road in East Palo Alto. Import soil and build portions of the new levees. Work on the Friendship Bridge extension. Install environmental enhancements within Faber Marsh. Plan for the in-channel work that will begin in June 2018. *Note: These are the projected activities based on the contractor's current schedule and may change throughout the course of the year. San Francisquito Creek is one of the last continuous riparian corridors on the San Francisco Peninsula, and is also home to 1 of the few remaining viable steelhead trout runs. The creek can cause severe flood damage with very little warning and has overflowed 7 times since 1910. During the February 1998 El Niño event, record flooding caused an estimated $28 million in damages in Palo Alto, East Palo Alto and Menlo Park. More than 1,100 homes were flooded in Palo Alto, and Highway 101 was closed, as were numerous other roadways. The largest flood on record prior to 1998 occurred in December of 1955 when the creek overtopped its banks in several locations, inundating about 1,200 acres of commercial and residential property. Damages were estimated at nearly $2 million in 1956 dollars. Total damages from a 1% flood event are estimated at $300 million in Santa Clara and San Mateo Counties, as calculated by the USACE in 2011. In November 2012 the voters of Santa Clara County overwhelmingly approved Measure B, the Safe, Clean Water and Natural Flood Protection Program, as a countywide special parcel tax for 15 years with a sunset date of June 30, 2028. This Program replaced the Clean, Safe Creeks and Natural Flood Protection Plan, which voters approved in November 2000. Each year, the District prepares a report providing a progress update for each of these Program priorities, along with fiscal year accomplishments. To ensure transparency and accountability to the voters, the ballot measure also created an Independent Monitoring Committee, appointed by the Santa Clara Valley Water District Board of Directors. The Independent Monitoring Committee [link to IMC page] annually reviews the Program’s progress to ensure the outcomes are achieved in a cost-efficient manner and reports its findings to the Board. In addition, the Program requires three independent audits, the first of which was conducted in FY 2017. View the Safe, Clean Water Program’s annual reports, annual IMC audit reports, and independent audits, including a staff response, on the District website.